Flash Boys: A Wall Street Revolt by Michael Lewis. New York: W. W. Norton & Co., 2014. 274 pp. Michael Lewis is a best-selling author of many well-known books including Liar’s Poker, Moneyball, The Blind Side, Boomerang, and The Big Short. This is a book about technology, and the building of a very special fiber optic cable with no switches. It is a story about high frequency trading. It is a mystery story about a trader who got interested in why, when he placed a large order to purchase stock at a given price, only some of the stock was available at that price. But ultimately it is a story about that trader, Brad Katsuyama, who solved the mystery not for his own personal gain, but because he cared about fairness. When a trader places a large order, the trade is often divided in to smaller orders and sent simultaneously to many different sellers. Brad found that instead of getting all of his order at the price stated, the screen would come back brown, indicating only some of the orders had been filled at the stated price. It was as if someone found out he was placing an order and jumped ahead of him in line to buy at the stated price, and then turned around to sell the stock to Brad at a slightly higher price. Rather than accepting this outcome, Brad set out to figure out what was going on. This is where the high speed cable comes into play. For the seller who gets the first of the orders, a few milliseconds is enough time to deduce what is happening, move to other sellers and buy the stock before the rest of the original order reaches them, and then resell the stock at a higher price, making money from the increase. It is as if those few milliseconds are like weeks of time to study, understand, deduce what is happening, and make a decision. Brad likened it to tickets going on sale to a big event, waiting in line all night, only to get to the window to find that scalpers had jumped the line, bought all of the tickets and now were selling them at a higher price. Many would respond to such a discovery with the question: How can I get in on the action? Brad responded with a different question: How can we make the market fair? In the end he has led the start of a new exchange that takes away the kinds of unfairness that he discovered. Flash Boys is a fascinating book on many levels. At one level it shows the fundamental way that technology can change a business. Why would anyone spend billions of dollars to gain a few milliseconds advantage for communicating an order? That is what was required to put in the cable with no junctions, saving small fractions of a second for the signal to travel from one place to the other. At a second level, this book is about the way trading is done in our exchanges, and the role of high frequency traders. 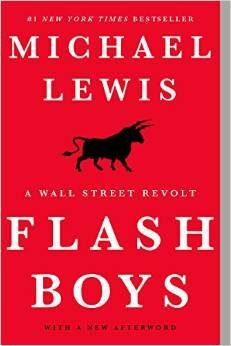 Some reviewers of the book have accused Lewis of being against high frequency traders, but that is not the point. What he is identifying is certain traders who get an unfair advantage over others. At a fourth level, this book raises questions about free market capitalism in a day of high speed technology. The fundamental premise of capitalism is that a free market is self-correcting. When a business cheats someone or charges too high a price, people simply stop dealing with that business and it goes away. Only the good and fair businesses survive and thrive. But when it takes years of work by very smart people to diagnose what someone is doing in milliseconds, the lag in that self-correction can be long enough to allow a great deal of money to be made before the market catches up. This “free market” may not be free at all. Many of the questions Lewis raises in this book are not answered. Raising the questions, however, is vital to starting a discussion on challenging societal issues. Flash Boys is well written, insightful, and provocative. I love what author Malcom Gladwell said of Lewis’s writing: “I read Michael Lewis for the same reason I watch Tiger Woods. I’ll never play like that. But it’s good to be reminded every now and again what genius looks like.” I recommend the book both as a great read and as fodder for a great discussion.